SHANE Warne has been the most outspoken critic of Australia's bowlers in recent weeks but internal feedback was just as scathing after day one of the fourth Test against India. Australia's bowling coach David Saker revealed on Friday that aggressive and animated discussions took place behind closed doors at the SCG on Thursday, when captain Tim Paine and his quicks weren't on the same page. Nathan Lyon also publicly questioned whether his team's fast bowlers got it right on day one. 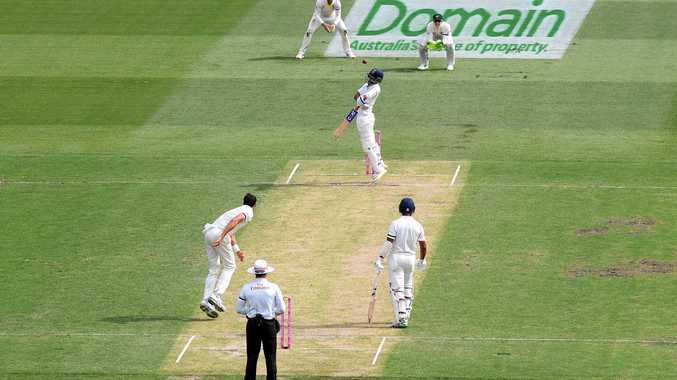 India marched to 7(dec)-622 on Friday but the platform for that imposing total was laid when they dominated day one, when they finished on 4-303. Mitchell Starc and Josh Hazlewood delivered lively new-ball spells but then unsuccessfully attempted to unsettle Cheteshwar Pujara and Mayank Agarwal with a bouncer barrage. "The bowlers wanted one thing. Tim wanted one thing," Saker told the ABC. "That's not been the case as the general rule but when you were watching from the sideline, you could see there was some confusion. "It wasn't great and it doesn't always happen, but we will work again." Saker and head coach Justin Langer both made their disappointment clear in no uncertain terms. "Last night we talked quite heavily about the day ... we thought it was a really disappointing day and we just wanted to get our point across," Saker said. "Some of it was quite aggressive and that's not like me usually. "I was quite animated, and I know I was not the only one. JL wasn't happy. The bowlers know that." Lyon also gave his teammates a clip while speaking to the same broadcaster. "I wasn't too happy about it," Lyon said of the quicks' short-pitched approach early on day one. "We missed out on using the moisture in the wicket. We could have stuck there longer. But the captain and the bowlers came up with a decent plan and, unfortunately, it didn't work."